We've been to New Orleans four times: in Dec./Jan. 1995/96, Oct./Nov. 1997, Dec./Jan. 1999/00 and Oct./Nov. 2000. Here are some of our photos which shall provide an impression why this is one of the most beautiful and versatile cities in the world. Please note that all these pictures are taken 'pre-Katrina'. We haven't been to New Orleans since, but we will go back! View over the Mississippi river with the Steamboat Natchez in the background. Fountain on Riverwalk, right beside the entrance to a gigantic shopping mall. In the back the 'Aquarium of the Americas'. St. Louis Cathedral on Jackson Square. Here you'll find fortune tellers, painters and musicians of every kind. Louis Armstrong Park on North Rampart Street, at the outer end of the French Quarter. House in the French Quarter with its famous 'wrought iron fences'. Christmas decorations in the Quarter. On Halloween all buildings are decorated. With skeletons, bats ... ... and a lot of pumpkins. The Café du Monde on Decatour Street. Open 365 days a year, 24 hours a day. The Coffee and Concierge on Royal Street. With a garden, delicate chairs and great blueberry muffins. The Royal Blend Cafe on Royal Street. Easy to overlook from the street. The courtyard of the Royal Blend Cafe. Perfect for hour-long newspaper reading. Gallier House, Royal Street. Inspiration for the town-house of Lestat and Louis in Anne Rice's novel 'Interview with the Vampire'. The dining room at Gallier House. Decorated with victorian christmas dishes. One of the living-rooms of Gallier House. The nursery of Gallier House, with tiny little furniture..
Dominique Stella House, 2915 Chestnut Street, Garden District. St. Charles Avenue, Garden District. One of the few 'ghost houses' on Prytannia Street in the Garden District. St. Elizabeth, a former orphanage on Napoleon Avenue, which now is owned by Anne Rice and which plays an important role in her novel 'Memnoch, the Devil'. Many thanks to Suzie Q. for the great tour! Brevard-Mmahat-Rice House, 1239 First Street. The Mayfair House in Anne Rice's novel 'The Witching Hour'. Left wing of the First Street House. Pitot House, 1440 Moss Street, on Bayou St. John. A former town plantation. Living room on the first floor of Pitot House. Some of the interiors of the movie 'Interview with the Vampire' were filmed here. transformed into a room for the movie. If you look close enough you can recognize the green window panes. Bedroom in Pitot House. In the movie this was 'Claudias' room. Hotel Villa Convento, 616 Ursulines St. The hall of the Hotel Villa Convento. In the background the door to the courtyard where breakfast was served. In Dec./Jan. 1999/00 we stayed at Gretel's Bed&Breakfast, 3337 Magazine St. (Corner of Louisiana Avenue, at the lower left corner of the Garden District.) The room at Gretel's Bed&Breakfast, with it's own entrance and front porch. TripSmarter.Com - Way More Than A City Guide! The BourboCam with live pictures from the Big Easy. The Mardi Gras Infopage - the only alternative to the carnival in Cologne/Germany. 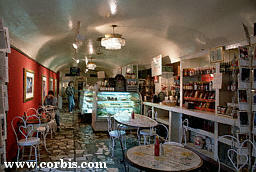 The Cafe Du Monde-page, where you can order the great coffee and beignet-mix online ... but don't forget the chickory! If you want to know something about the 'underground' of New Orleans you're right at the 'Haunted'-page of NOLA Live! The restaurant where we definitely have to eat at every stay is The Court of two Sisters on Royal Street. The Courtyard Bread Pudding is simply delicious !! Holiday mood at home: at French Market Coffee you can order all kinds of coffee.